The documentary series Miracle of Faith, aims to show through the personalities of a broad scope of Christians who live in the land of Israel today, the unique story that made Christianity the most wide spread of all religions in the world, as it is so deeply rooted in the Holy Land. In the year 2000, the world attention shifted to the largest of the monotheistic religions, Christianity as it marked the 2000th anniversary of the birth of Jesus Christ. Much of that interest was focused on the place where it all began: the Holy Land. A time of celebrations and pilgrimages, a time of joyous worship and meaningful reflections for Christians of all denominations. But also a time to reflect upon the roots and history of Christianity in the Holy Land and its current situation in Israel, the Palestinian Autonomous Areas and Jordan. The series shows 2000 years of Christian presence in the Holy Land, under Roman, Byzantine, Muslim, Crusader, British and finally Israeli and rule. It will seek to uncover the secret of Christian survival under often difficult circumstances. And finally it will look at the mosaic of contemporary Christians in the Holy Land as they keep the Christian presence alive in a not always friendly environment, but always motivated by their strong faith - their MIRACLE OF FAITH. The story of Christianity's tenacious ties to the Holy Land through the personal stories of a broad scope of remarkable Christians, many of whom were not born there but have chosen to make the land of the Bible their home. It is not an historical documentary and not a travelogue, but a tribute to the single-minded determination of contemporary Christians to maintain their presence and their faith in the land where it all began. The first episode will take the viewer back to the times of Jesus and to Early Christianity. In recent years Jewish and Christian scholars who study the Second Temple period have made remarkable discoveries. These discoveries were made possible by the study of the Dead Sea Scrolls at Qumran, by archaeological digs at many places in the Holy Land and by the study of Talmudic sources and comparing these with the New Testament. Often Christian scholars conduct their research together with Israeli scholars. One of the academic schools who study the Jewish roots of Christianity is called the Jerusalem School of Synoptic Research, which was founded by Prof. David Flusser and the late Dr. Robert Lindsay. The new discoveries shed new and fresh light upon the life and time of Jesus and His first followers. About one thing contemporary scholars agree: Jesus can only be understood in his Jewish context. "When Jesus is viewed among the Gentiles, the significance of Jewish culture and custom is minimized or forgotten altogether. But when Jesus is viewed as a Jew within the context of first-century Judaism, an entirely different portrait emerges... Jesus is inextricable linked to his people and their faith. To understand Jesus, we must learn to love his people and his religion. He came not to destroy but to fulfill" (xxii-xxiii). "Although Jesus was Jewish, his theology is sometimes treated as if he were Christian. But Jesus never attended a Church. He never celebrated Christmas. He never wore new clothes on Eastern Sunday. His cultural orientation was rooted deeply in the faith experience of his people. He celebrated the Passover. He ate kosher food. He offered prayers in the temple of Jerusalem... Jesus should be viewed as an integral part of Judaism during his day" (xxxiv). The Biblical Heritage brings the viewer to Bethlehem, the birthplace of Jesus, the magnificence of Jerusalem during the Second Temple period and to the Galilee. The birth of Jesus is an important festivity till today, when the patriarch enters the city. It will shed new light on the Jewish Jesus, the Jesus who felt at home in the world of traditional Jewish life and learning as it was practiced in the days of the Second Temple. The first community of Jewish believers emerged in Jerusalem, marking the beginning of Christianity. Dr. Stephen Notley, Assistant Professor of New Testament and Early Christianity at Jerusalem University College and visiting lecturer at King's college, London, will explain everything about the Jewish Jesus and the Jewish Roots of Christianity. As an American Evangelical Christian he spent 12 years studying Judaism from the time of Jesus with the world renowned Jewish expert on Jesus, Prof. David Flusser. Notley is deeply motivated by his Christian faith to examine, understand and teach the Jewish roots of early Christianity in the Holy Land. The Biblical Heritage will also bring us to Malcolm Lowe, expert on Greek philosophy and New Testament scholar. He was born in Wales, but lives in Israel since 1970. He lectured at the Hebrew University of Jerusalem and the catholic Ratisbonne institute. Lowe is one of the most outstanding experts on Early Christianity in Israel today. We will meet with him again in the second and third parts of the series. We also hear the story of Rev. Dr. Randall D. Smith. This expert on the Second Temple Period came to Israel 7 years ago, where he established the Jerusalem Institute. We watch him touring the Galilee, lecturing Christians about the historic relationship between Judaism and Christianity. He travels with his guests both through Israel and the Palestinian areas. As a foreign Christian he thinks it important to have good relations with both sides. Smith works close together with Dr. Jim Fleming, a well-known specialist Second Temple period, director Biblical Resources in Ein Kerem. Fleming brings back to life the world of the Bible in his Biblical Garden, which attracts thousands of visitors per year. The knowledge about the first century has been tremendously increased by recent archaeological discoveries, of which many Christians in the world are totally unaware. Some of these discoveries have been made in the vicinity of the Temple Mount. Dan Banhat, former Jerusalem district archeologist, will explain about these discoveries and about the relation between Jesus and the Temple. In The Biblical Heritage viewers will also meet Magen Broshi, the former director of the Shrine of the Books. Broshi explains in Qumran, where he conducted archaeological research, about the different groups and sects in the time of Jesus and about the relevance of the Qumram Sects and the Dead Sea Srolls for early Christianity. The Sea of Galilee and its vicinity have been of much importance for Jesus and his disciples. Although very much a tourist site, the area has not lost its beauty and traces of the time of Jesus can be found everywhere. Mendel Nun, a former fisherman and member of kibbutz Ein Gev, is an authority on the Sea of Galilee. He writes about the Sea of Galilee and its surroundings, and he authored about fishing at the Sea of Galilee in ancient times. Nun and Yoel Ben Yoseph, the director of the fishing museum, will explain fishing and the Sea of Galilee. We also meet the renowned Jewish scholars on the Second Temple Period, David Flusser, professor Emeritus at the Hebrew University, taught Judaism in the Second Temple Period and Early Christianity. As an orthodox Jew, Flusser spent decades studying the life of Jesus in his Jewish context. In his recent book entitled Jesus he brings a wealth of new information regarding the first-century setting in light of the Dead Sea Scrolls, historical inquiry, and recent archaeological sources. Bethlehem and surroundings, birthplace of Jesus. The Galilee, where Jesus spent mist of his life and where his disciples came from. Jerusalem, where many traces of Second Temple period life can be found. The second episode takes us from the Second Temple Period to modern times. The viewer will witness how Christianity departed from its Jewish roots and how it struggled and developed in the Holy Land. The Historical Heritage will trace the Roman and Byzantine Christian life in the Holy Land. Jews and Christians lived next to each other in wealthy cities like Sepphoris and Scythopolis in the Galilee, which are being unearthed now. Hermits and monks moved into the mountains of the Judean desert, attracted by, according Yizhar Hirschfeld, "a region of unique beauty whose climate is comfortable and suitable for monastic life." The holy men of the Judean desert performed miracles and taught the first pilgrims who came to the Holy Land. Some of the monasteries exist even till today, while others lay waste in desolate areas of the desert sand. One of the monasteries is the Greek Orthodox Mar Saba Monastery east of Bethlehem, one of the oldest inhabited monasteries in the world. Dating back to the 5th century, it was founded by Saint Sabas of Cappadocia. Women are not allowed to enter, but can view the monastery from the Women's Tower on the right entrance. Christianity managed to survive in the centuries of Muslim rule. While most Muslim rulers were benevolent towards Christians, others were harsh and destroyed Christian churches. In 1099 the Crusaders arrived to liberate the Holy Land from Muslim oppression, but both Jews and Muslims vividly remember how they massacred the members of their communities. The Crusaders built castles, abbeys and manor houses surrounded by fertile fields. The heritage of the Crusaders is still visible today. In the Galilee huge Crusader fortresses, like Yehi�am, in the middle of forests remind us of the splendor of the Latin Kingdom. Beneath the Old City of the mixed Arab-Jewish harbor town of Acre (Akko) appears to be a Crusader town, complete with halls and alleyways. The Israeli Antiquities Authority excavates and renovates this former stronghold of the Crusaders. The Historical Heritage will bring the viewer to the Horns of Hattin, where Saladin defeated the Crusaders in 1187. The Crusaders recovered parts of their former territories through treaties, but the castles and fortifications of Jerusalem had been torn down. 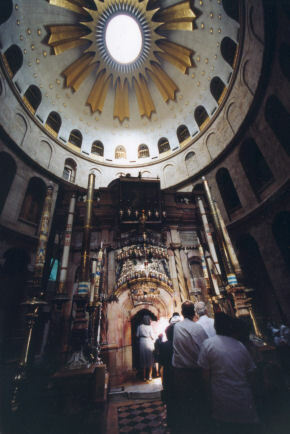 Dan Bahat will reappear in this episode, and explain about crusader remains in Jerusalem and about the Holy Sepulchre. In the Mamluk Period (1250-1517) and the Ottoman Empire (1517-1918) the Holy Land was often no more than a backwater, but it continued to attack pilgrims and scholars. Meanwhile, the Christian population managed to hold out and guard their heritage. In this second part of the series, we will meet with Dr. Yizhar Hirschfeld, an archeologist who specializes in the land of Israel in the Byzantine period. He will be able to unlock the secrets of ancient city of Tiberias, where he conducts archaeological research. The Historical Heritage will also feature some other well-known experts on the history of the Christianity in the Holy Land. We meet with, Petra Heldt, who is married to Malcolm Lowe. She is a Lutheran pastor and specialist in Byzantine Church history. In ancient monasteries in Judea she explains about the church fathers and early Christianity and how Christianity departed from its Jewish roots. A rather unknown group is the Syrian orthodox Christians. One of them, Simon Can, lives in Old City. He is an important scholar of Church History. The commentaries on the Bible are so holy to him, that he reads them on his knees. We also meet the archbishop of the Syrian Orthodox church, Mar Sewerios, and Jack Khazmo, who explains about the St. Mark's church, which claims to possess the oldest icon in the world. In the Old City we also meet Miss Sophie and bishop Aristocos, connected to the Greek Orthodox Patriarchate in Jerusalem. The Greek Orthodox represents the largest Christian community in the Holy Land. Of course we also meet with the Armenians, who established a community in the Holy Land in the fifth century, which lasts till today. Kevork (George) Hintlian, director Armenian Museum in Jerusalem's Old City, historian, and author of the History of the Armenians in the Holy Land is a well-known personality in ecumenical circles. He lives in the picturesque Armenian Quarter in the Old City, where the clergy mark the religious holidays with colorful ceremonies. Throughout history, Arab Christians remained in the Holy Land. We meet with the Jordanian Protestant Pastor Labib Madanat, who lives now in Jerusalem, where he directs the Bible Society in Jerusalem, the West Bank and Gaza. With him we travel to Jordan with its Christians who trace their history back to the earliest days of the Church. We also meet with Vassilios Tsaferis, director of excavations, Antiquities Authority, and a member of the Greek Orthodox Church, and with Ora Limor of the Open University. She is a specialist in Christian pilgrimage. Sepphoris and Tiberias, Roman and Byzantine period. Akko, Crusader period. The Negev, in the footsteps of ancient Christian communities which dwelt in the desert. Galilee, beautiful ancient Crusader castles are hidden in the Galilea landscape Jerusalem. Monasteries and caves in the Judean desert. The third episode will lead the viewer to the modern history of the Christian heritage and the contemporary situation. Western Christianity witnessed a religious revival in the 19th century, which manifested itself in a renewed interest for the Holy Land. Explorers, photographers and missionaries flocked to Jerusalem. The British dedicated the first Anglican Church in the Middle East, Christ Church, in 1849. Till today Christ Church is a flourishing ministry in the Old City, which hosts four different congregations, a study-tour program called Shoresh Tours, a hostel, a restaurant and a bookshop. Here we meet with Ray and Jill Lockheart, who left England to live in Israel to work near the noisy Jaffa Gate in the Old City. Western Christians are nowadays very active in Israel and the areas controlled by the Palestinian authority. They are, sometimes as part of missionary institutions, active in social, educational and medical work. One of the most dramatic stories combining Christian faith and the Holy Land is that of one American family, the Spaffords, who suffered a deep personal tragedy when Mrs. Spafford's four children died in a shipwreck. After the tragedy, the father, Horatio, authored the hymn "It is Well with My Soul" and subsequently led a group of devout American Protestants to settle in Jerusalem in 1881. They would come to be known ad "The American Colony" and eventually the Spaffords set up their first home in the Old City as an orphanage and hospital. Today what began as a mission of faith continues its humanitarian work as The Spafford Children Center run by Dr. Jantien Dajani, a Dutch doctor who has built her family and career serving the needy in Jerusalem. This episode will tell the story of the Spaffords through the eyes of Dr. Dajani as well as Miri Franji, the center's Armenian nurse and the last remaining Spafford, Mrs. Vester, who still lives at the American Colony Hotel in Jerusalem. We also meet again the Syrian Orthodox community, where the mukhtar (community head) Sami Barsom will explain in the center of the community about the daily life of what they claim in the most ancient church of the world. The Modern Heritage also looks at the status of Christians and Christianity in the Holy Land today. The 170.000 Christians, most of them Arab, some 130.000 within Israel, including 10.000 in Jerusalem, and 40.000 in the areas of the Palestinian Authority, have long felt uneasy as a minority within a minority. Today, they are contending with the increasingly more militant forces of a resurgent Islam, a difficult economic situation due to a stalled peace process and a high emigration rate. The result is that there are no more than a handful of villages in the Holy Land with a Christian majority. Bethlehem, once mostly Christian is now 70 percent Muslim. And Nazareth too no longer has a Christian majority. The story of the Arab Christians in Israel will be told through the family of Nuha Kawar in Nazareth. Nuha is a writer and poet and activist for peace and coexistence between people of all ethnic and religious background. She bravely travels to places like the Arab village of Turan, which has a recent history of Muslim-Christian conflict to speak on behalf of tolerance and understanding. The story of the Palestinian Christians in Bethlehem and Jerusalem will be told by Julia Dabdoub, who represents one of the families that have lived in Bethlehem for centuries. She directs a museum of the Palestinian national heritage in the heart of Bethlehem, which is renovated right now in preparation for the Year 2000. We will also meet with Naim Khoury, pastor of the First Baptist Bible Church in Bethlehem, who directs a small radio evangelical radio station in Bethlehem and who obtained permission to start a Christian television company, and with Alex Awad , the Palestinian-American pastor of the Baptist Church in East-Jerusalem, and a tutor at the Bethlehem Bible College. Among the 8000 expatriate Christians living in the Israel there is a growing concern about the antagonism and even hostility expressed towards them by extreme Orthodox politicians, government officials and even ministers in the Government. One of the leaders of the Protestant and Evangelical movement in Israel and the areas of the Palestinian Authority is Charles Kopp, pastor of the international congregation in the Narkiss Street. In the fifties, Kopp's grandfather moved to Israel, and he and his father followed. Charles Kopp, an American citizen, has lived most of his life in Israel. He met there his wife Elisabeth from a Czech Christian family who fled for the Communists. Kopp is chairman of the UCCI, the United Christian Council in Israel, which lobbies against the anti-mission bill of Rafael Pinhasi of the Shas party, and other initiatives which seek to impeach on Christian liberties. We also return to Stephn Notly when we see them in and their families in the daily life as a Christians in Israel. In The Modern Heritage we also meet with the Hebraists Halvor and Mirrja Ronning. Dr. Ronning is a well-known Israeli tour guide, specialist Second Temple Period, who, together with his wife initiated the Home for the Bible Translators in Mevasseret Zion, where black African students study Hebrew and the Jewish roots of Christianity, in conjunction with the Hebrew University of Jerusalem. This course helps the translators to translate the Tenach (Old Testament) into Hebrew in their native languages. One of the tutors in the Home for the Bible Translators is Mrs. Julie Bentinck, who is connected to the Wycliffe Bible translators and went to live in Ivory Coast to translate the Bible. We wil also meet David and Jose Parsons, of the international Christian Embassy in Jerusalem, which attempts to encourage support among Christians world wide for Israel, which, they claim, is often unfairly criticized. A simular story is told by Clarence Wagner of Bridges for Peace. A complete different story will be told by Sister Abraham, the daughter of a Danish minister who found her calling as a nun in the Ethiopian Church in Jerusalem. She lives in A-Tur (Mount of Olives), in a benedictan monastery. She paints Ethiopian icons. She is also leading religious activities for students at the Hebrew University. Another remarkable woman is Petra Held. She got severely injured in 1997 in a terrorist bombing when she was shopping at the Mahane Yehuda market. She says she does not harbor feelings of animosity towards the perpetrators, who she sees as victims of their own hatred. Even though she had not been fully recuperated, she continued her work as executive secretary of the Ecumenical Theological Research Fraternity in Israel. The Fraternity brings together Christians of all denominations in Israel for lectures. We also meet again with her husband Malcom Lowe, who is the editor of Immanuel, a renowned academic journal published by the Ecumenical Theological Research Fraternity in Israel. Both Heldt and Lowe are very active in the Jewish-Christian dialogue, because they care about an improvement of Jewish-Christian relations. His daily life as a Christian in the Jewish world has helped him to understand a lot of difficult to interpret Bible passages. We also return to Pau and Anneke Figueras and the family of Stephen Notley and see them in and their families in the daily life as Christians in Israel.